Chaufa is the name that in Peru we give to the Fried Rice, though in this case we are not doing rice for a more healthy version of it, i still decided to call it like that. 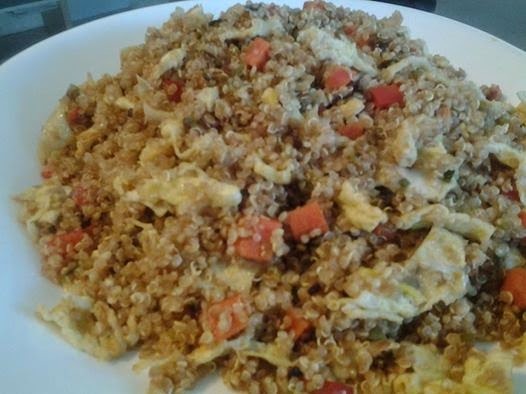 As you can see Quinoa versatility is easy, so get cooking and find new ways. 1. Heat sauté pan and brush with oil. 2. Beat eggs 2 or 1 at the time, and fry them like a flat omelet, like a tortilla but of eggs, do all the eggs, dice and reserve. 3. Using the same sauté pan, heat it back up and this time add both oils. 4. Add the next 3 ingredients all together ( whites of green onions, garlic and ginger), brown them for 1 minute. 5. Add the carrots and red peppers, brown a little bit, make sure you have enough oil, and keep a stirring/mixing motion. 6. Add the Quinoa and start mixing all together with a frying browning motion, at the same time incorporate soy sauce, rice vinegar, sherry liquor. 7. When done taste and add the green part of the green onions, the green peas (if using) and the reserved egg, mix well. 8. Serve hot with your favorite side, or add protein to the mix and make it a complete dish on its own.